Count Kalnoky uses only locally-bred horses—many are bred on the premises—of the Lipizzaner, Shagya Arabian, Hutzul, , Bucovina and Semigreu breeds. The calm, well-mannered temperament of these horses makes them well-suited to riders of varying abilities, with the Arabs being more suited for experienced riders. And because the horses remain at the centre long-term, the staff know the character and special needs of each animal. Horses average between 1.4 metres and 1.6 metres (14 hands to 15.2 hands), are of medium build, and are adaptable, fit, and well-suited to the terrain and the arabs can also become rather fast. 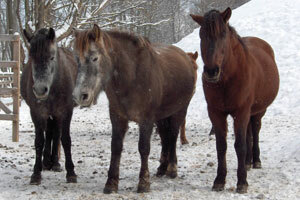 Mares and geldings are used, although the centre’s stock does include stallions for breeding. English general purpose and endurance saddles are used on all horses and some stock saddles, which are rather like military saddles, are also available. 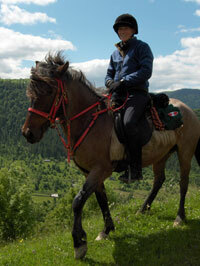 Horses are vital to life in Transylvania and Count Kalnoky upholds the highest standards of horsemanship and care. The horses are shod using the most up-to-date Natural Balance techniques, which more closely simulate how the animal’s feet would be without human intervention. Count Kalnoky believes that the estate’s horses are amongst the best shod and cared for in the country. The Shagya-Arabian Horse was developed in the Austro-Hungarian Empire over 200 years ago. The breed originated from the need for a horse with the endurance, intelligence and character of an Arabian but with larger size and carrying capacity required by the Imperial Hussars. The registry of the breed is the oldest next to the registry of the English Hunt Club. The Centre owns 2 geldings, 2 mares and a breeding stallion. The Hutzul (also called Hutul, Huzul, and Hucul), the characteristic breed of the Carpathian Mountains, descended from the primitive Tarpan. The centre’s Hutzuls hail from the historic Lucina stud, which was breeding horses for the Moldavian prince Stephen the Great (Stefan cel Mare) in the 15th century. The Hutzul is strong, lively, sensible, sure-footed, frugal, and resistant to severe winter weather, making it an ideal mountain breed. To increase size, we crossbreed Hutzuls with Lipizzaners. 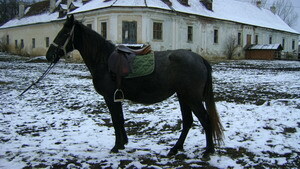 The Bucovina is a development of the Hutzul, obtained by using a heavier stallion. 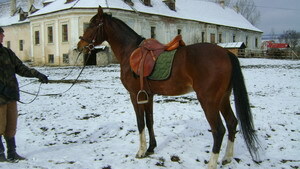 It is the typical breed of the Bucovina region, which is north-east of Transylvania.Roua (pictured) is a typical Bucovina mare, sired by the splendid stallion Molid I at Lucina stud. Molid’s sire was 75% Ardennes and 25% Trotter and his dam was Heavy Draft Hungarian. Roua stands at around 14.2 hands (1.45 metres) and is a strong, kind, and sensible mare. The Lipizzaner breed dates back to the 16th century, when it was developed with the support of the Hapsburgs. The breed takes its name from one of the earliest stud farms estabilished, located near Lipica (spelled “Lipizza” in Italian), in modern-day Slovenia. The centre has two purebred Lipizzaner mares, two foals and a stallion. 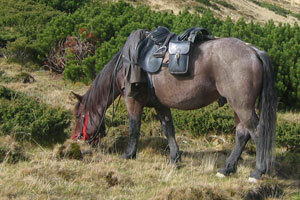 The Semigreu medium draught horse was created after, Second World War to improve the local horse stock. The breed was created in two strains, the larger from the Ardennes, Trotter, and Furioso-North Star (an Anglo-Arabian derivative), and the smaller from the Ardennes, Lipizzaner, and a variety of local horses such as Hutzuls and even Arabians. The result was a strong, energetic, versatile breed. We use the Semigreu mostly for pulling carts and working, but they can also perform as a reliable, energetic riding horse.